The Enviroblue Combi-Pac External 26kW Oil Boiler is a highly reliable boiler that’s been designed by Firebird. The variety of features and benefits of this unit contribute towards a high efficiency rating of 93% as well as boasting an excellent hot water performance of over 20 litres per minute. As an outdoor condensing floor standing boiler, this unit will be saving some much needed space in the home. With an output rating of 26kW, this boiler is perfect for smaller homes that don’t have such a high demand for heating or hot water. This unit does come in a range of other outputs too, ranging from 20-35kW which helps to make sure there’s an output to suit the heating and hot water demands of your home. With this unit being a combi boiler it is an water heater and a central heating boiler wrapped into one, you won’t require a water cylinder, another great way to help save you that much needed space in your home. The many features of this boiler includes full insulation to help prevent heat loss, a patented heat exchanger design and has the added bonus of being ultra quiet in operation. 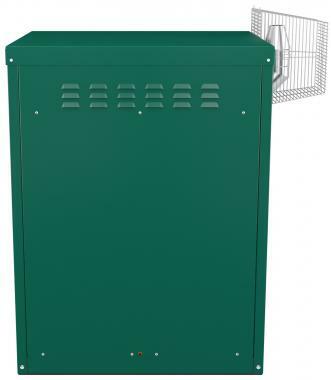 It’s also fitted with a high quality weatherproof galvanised PVC coated casing as well as a frost protection stat to help protect your unit from any weather thrown its way. In the unlikely event of your boiler going wrong, it’s fitted with a high performance Riello RDB blue flame technology control box with full diagnostic controls so you’ll be able spot the issue with your boiler straight away. Featuring a 2 year warranty you can install this boiler safe in the knowledge that it won’t be letting you down.